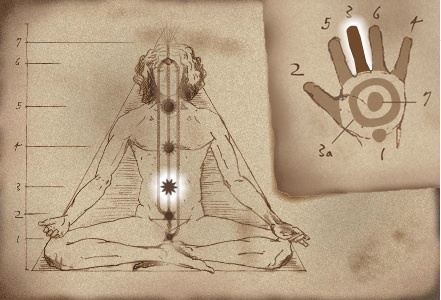 Balance, growth, satisfaction and righteousness; these are some of the qualities manifested by the Nabhi chakra. Each of these qualities are manifested by and central to, the Nabhi and the Void. As the Kundalini rises and pierces the Nabhi, it removes any obstructions to the function of the Nabhi, and allows the above qualities to be more easily expressed by the individual. The expression of these qualities strengthens the Nabhi chakra in turn. This process creates a self-reinforcing cycle, improving the Nabhi and allowing the Kundalini to continue ascending. Linked to the Nabhi, is the Void. The basis of the Void is the guru or teacher principle. This quality can be understood to encompass self-discipline, dharma (or the quality of righteousness, which is also shared by the Nabhi), and self-taught spiritual growth. The affirmation, “I am my own Guru (Teacher)”, reflects this. To be your own Guru is to innately know right from wrong and to know which path one should take to gain spiritual knowledge.